Hermione Granger, now the respected Minister for Magic in the British wizarding community, continues to delight as the intelligent, overachieving witch Harry Potter fans adore. As a married mother of two with the most demanding role in the magical government, she handles her various roles with grace and wit. A major plot point in the story involves alternate timelines, including one in which Voldemort survives the Battle of Hogwarts and Hermione is the most wanted rebel witch in Europe. After spending decades fighting Voldemort’s tyrannical rule, she ultimately sacrifices herself to the Dementors to fix the timeline. Whether she’s an effective Minister or a stunning warrior, Hermione will always be an extraordinary character. Now the Headmistress of Hogwarts, Professor McGonagall remains as poised and witty as ever. Always prepared with a (well-deserved) verbal barb, she tells Harry’s son that “bravery doesn’t forgive stupidity” and threatens to put Hermione—the Minister for Magic—in detention. McGonagall runs a tight ship at Hogwarts, but she’s also a softie (and a die-hard Gryffindor quidditch fan) at heart. As Harry Potter’s middle child who is sorted into Slytherin, Albus struggles to define his identity. His teen years are marked by a growing rift in his relationship with Harry, whose heroic shadow dwarfs Albus at Hogwarts. Yet this marginalized kid shares some of his father’s best qualities—bravery and loyalty. Albus risks his life traveling back in time to save Cedric Diggory, and he remains a steady friend to Scorpius Malfoy (Draco’s painfully unpopular son). When Scorpius fears the rumors are true that Voldemort is his father, Albus displays remarkable compassion, saying, “I don’t think Voldemort is capable of having a kind son—and you’re kind, Scorpius. To the depths of your belly, to the tips of your fingers. I truly believe Voldemort—Voldemort couldn’t have a child like you.” Albus transcends the label of “Harry Potter’s son,” developing into a passionate, three-dimensional character. Snape is alive?! Well, yes and no. In one of Harry Potter and the Cursed Child’s alternate timelines, Voldemort survives yet never murders Snape. Professor Snape still teaches at Hogwarts, in addition to secretly supporting the resistance against the Dark Lord. He’s the same character fans love, quick to verbally berate Hermione (saying, “You were a terrible bore of a student,”) and to sacrifice himself to correct the timeline. In a heartbreaking scene, Snape—knowing he will die—says to Scorpius, “Tell Albus—tell Albus Severus—I’m proud he carries my name.” Snape remains loyal to Harry’s mother, Lily, and her cause until death, revealing that he truly is one of the best characters of the entire series. Who would have believed that Draco Malfoy’s son would be the best character in a Harry Potter story? With rumors swirling that he’s actually the child of Voldemort, Scorpius could have embraced the darkness and become a disturbed kid obsessed with evil. Instead, he’s an incredible optimist and a loyal friend to Albus Potter. Scorpius exhibits wisdom far beyond his years, choosing to restore the world to its original timeline rather than remain in one where he’s the most popular and powerful student at Hogwarts. He’s also an adorable romantic, intent on winning the heart of Hermione and Ron’s daughter Rose Granger-Weasley (even though his awkward attempts at flirting spectacularly fail). 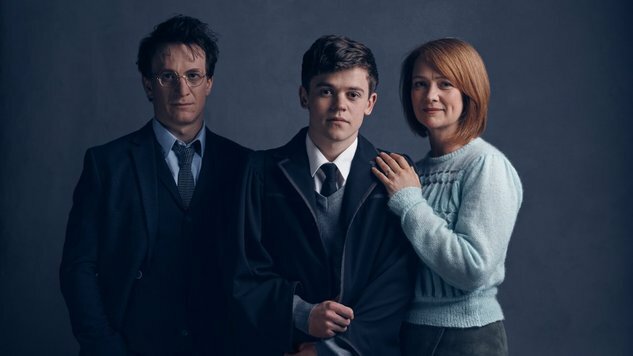 In Scorpius, Harry Potter fans find an endearing hero for a new generation. Until she reveals herself as a grenade-wielding witch who has worked on the train for 190 years! Boasting a perfect Hogwarts delivery record (no student has escaped the train on her watch, not even “Sirius Black and his cronies”), she’s furious when Albus and Scorpius plan to flee by jumping off the roof. So the Trolley Witch transfigures her hands into very sharp spikes and threatens them with Pumpkin Pasties that double as explosives. In just one scene, the most forgettable character in the series transforms into a badass witch who bakes her own ammunition. And it is GLORIOUS. To celebrate the book’s release, we’ve assembled a list of the story’s five best characters* (and one honorable mention). Enjoy browsing the gallery, but be warned: there are major spoilers ahead. *This list is solely based on the script; this writer has not seen the play and is not critiquing the actors’ performances.